This magnificent hotel marries timeless elegance and contemporary style. Set within a district designated as a UNESCO World Heritage Site, this hotel is the perfect base from which to explore the city's most famous historic and cultural sites, museums and shopping destinatons. Exquisitely decorated guest rooms and suites, plush amenities and impeccable service make you feel right at home and truly pampered. Located within Vienna's historic center. Approximately 13 miles from Vienna International Airport. 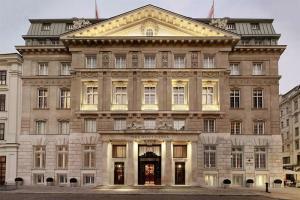 The Bank Brasserie & Bar - all-day dining; Cafe Am Hof; Living Room; Lounge - afternoon tea.